Rejuvenate your mind and your body through the power of massage. Not only can massage therapy help you fall into a state of complete relaxation, but it can also be used as way to overcome chronic pain and deal with other conditions that affect the mind and the body in Winston-Salem, North Carolina. At Lotus 5 Senses Spa, our massages last a full 60 minutes, and we offer a wide range of different massage options, including Swedish massages, couple’s massages, prenatal massages, and reflexology massages, to meet the different needs and preferences of our clients. Extended research has been conducted on the benefits of massage therapy, and some studies have discovered that massage may be helpful for digestive disorders, anxiety, headaches, insomnia, soft tissue injuries, sports injuries, and temporomandibular joint pain. 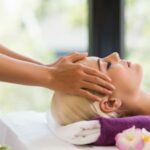 Beyond the benefits of using massage for certain health conditions, massage therapy is an excellent way to relax, unwind, and refocus your body’s healing energy. When you schedule a massage therapy appointment at our spa, you don’t need to make any special preparations. Simply come as you are, and let us know about any special symptoms you are experiencing. This will allow us to personalize your massage experience and make it that much more relaxing and enjoyable. Whether massage therapy is part of your weekly routine or you have never indulged in a massage before, contact us at Lotus 5 Senses Spa to book your next massage appointment. We look forward to increasing your health and well-being through the relaxing power of massage! At Lotus 5 Senses Spa, we offer massage therapy services to residents of Winston-Salem, Pfafftown, Kernersville, East Bend, Clemmons, Lewisville, Rural Hall, and King North Carolina. Visit us to relax and unwind from the constant stressors of daily life.